M.C. Collinson, Plant Evolution and Ecology during the Early Cainozoic Diversification. E.M. Freis and P.K. Endress, Origin and Evolution of Angiosperm Flowers. I.M. Miller, Bacterial Leaf Nodule Symbiosis. J.F. Vincent, Fracture Properties of Plants. Each chapter includes references. Author Index. Subject Index. 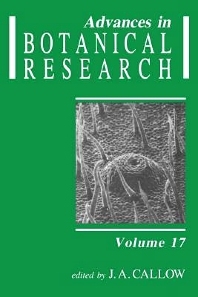 This latest volume in the series focuses on evolution and palaeobotany, plant-microbe interactions, and biomechanics. Collinson reviews the Early Tertiary floras and presents new evidence on the evolution and diversification of land plants using computer analysis of plant assemblages and reconstructions of fossil plants and plant communities. Fries and Endress combine the skills of palaeobotanists and neobotanists to more closely examine the evolution and morphology of angiosperm flowers. Miller turns his attention to the bacteria symbiotic in the leaf nodules of plants. This most complex of relationships between bacteria and higher plants involves a close and lifelong interaction at the deepest cellular level and is a fascinating system only poorly understood as of yet. Vincent deals with the fracture properties of plants--an important subject both for the plant trying to survive in a hostile environment and for its implications for agriculture and the palatability of food. Botanists in all fields of research.